While once one of a new wave of sports coupes, Honda’s CRX is now pretty old school. Today’s Nice Price of Crack Pipe contender will show you how it was once done, if its price doesn’t presently do it in. Tick, tick, tick, tick… Do you hear that? That’s any number of complicated 20-plus year old cars getting ready to turn your wallet into an all you can eat buffet while ensuring your mechanic’s kids get into the best colleges and do a lot of blow. Now, that might not be the case with last Friday’s 1995 Audi S6 Quattro sedan—after all five previous individuals have made it though ownership—but the threat still still is there, like a rescued pitfall that unbeknownst to you was once owned by Micheal Vick. That ominous specter of looming doom was enough to warrant a Crack Pipe vote from 75% of you for that car’s $8,400 price, emboldened by the few of you who had owned similar rides piping in to share your own, terrifying experiences. When it comes to Hondas, there’s usually not a lot to be scared of. In fact, despite coming from a country that invented vending machines that sell used women’s underwear, and the $300 cantaloupe, Honda’s cars have almost always been remarkably sane, if not on occasion downright mundane. The CRX was one instance where the company decided to cut loose. After a decade of producing the most efficient and sensible family cars possible, Honda decided to do a modern interpretation of the traditional sports car. That recipe was to take a family car and make it smaller and lighter and sportier, and maybe for fewer people so there was less need to clean up barf after a particularly aggressive run through the twisties. The car shared its basic underpinnings with the rest of the Civic line, only with a 5.3-inch shorter overall length riding on a demur 86.6-inch wheel base. That, by the way, was the same wheelbase as the original Civic—which was a four-seater—while the capacity of the CRX is only two. Progress? Yeah, I guess so, if you hate a crowd. 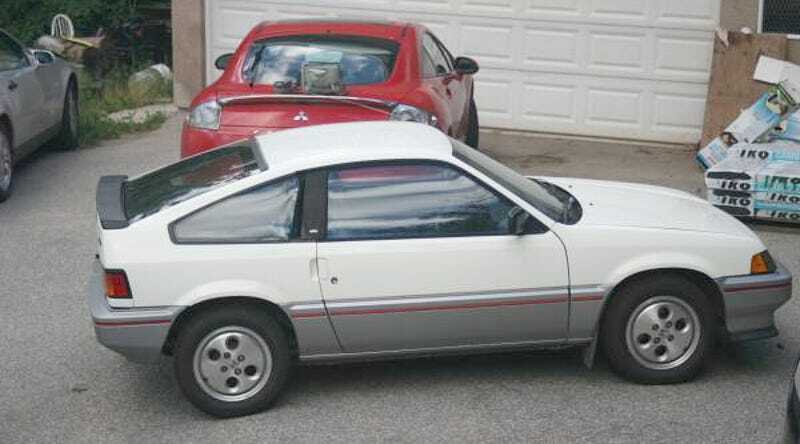 This 1984 CRX HF (High Fuel Economy) is offered in Vancouver, Canada and comes with Honda’s 1,342-cc, 12-valve four cylinder, backed up by a five-speed manual with ratios chosen for efficiency not alacrity. All together that was good for 60-horses and about 51 mpg on the highway—in the right lane if you please. The seller says he averages 45 mpg and then confusingly notes that the car has 188,000 kilometers on the clock. That’s due to this being a Canadian car, eh. Appropriate for a country that gets a lot of snow, this CRX is white on top and grey down below. These cars have a lot of plastic parts of various compositions for their body panels—front fenders, bumpers, rocker covers, etc—and those tend not to age well in the extreme cold. This one looks to have done pretty well, and the body, aside from some areas showing surface rust, looks to be in excellent condition. The interior too seems to have held up well, and man, what a wide-open space that floorboard seems to be! Mechanically? Well, the seller says it’s never let him down, and that it’s a lot of fun to drive. I guess if it was breaking down all the time it wouldn’t be all that much fun, so there you go. What’s not to like? Well, there’s a crack in the windshield which you’d probably want to take care of, and there’s that rust which may eventually catch up with the car. Then there’s the price which you may either like a lot, or loathe, seeing as you’re a pretty diverse group. That price is $2,550 Canadian, which works out at present exchange rates to about $1,887 American, or 215,000 Yen back at Honda HQ. What do you think about this car for that price? Does that seem like a deal for a survivor CRX that still gets hybrid-style mileage? Or, is that just too much for so little? Vancouver Craigslist, or go here if the ad disappears. H/T to that’s not gone well for the hookup!